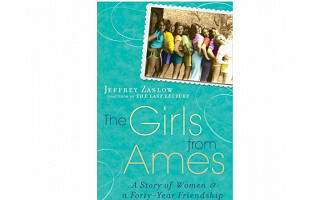 Jeffrey Zaslow may seem like an unlikely candidate for writing a moving history of the friendship of a group of women from Iowa over the last forty years—he is, after all, male—but he does a masterful job of sharing this compelling story. Maybe it’s because he’s male (and can therefore tell it from the vantage point of outside-looking-in), or maybe it’s because of his prior experience in helping to shape a powerful message into book form (he co-authored The New York Times bestseller The Last Lecture with Randy Pausch), but whatever the reason, Zaslow introduces us to the girls from Ames and then inserts each one of them into our hearts. This is not a story about flowers and rainbows and perfection and happy endings. This is a story about real people, with real foibles, real heartbreaks, and how their bonds with one another have buoyed them through the years. It’s about how women need other women to thrive, and how friendships don’t have to be perfect to be just right. Forty years after they met as kids in Ames, these women are still every inch a tribe. I devoured this book in the course of a weekend, cried over it more than once, and then recommended it to every woman I love. You will, too. Hi Daily Grommet fans. This book is about 11 girls growing up together in Ames, Iowa. Now they are 10 women in their mid-40s, spread all over the country, and they remain the closest of friends. Whenever “the Ames girls” get together, it’s as if they’ve stepped into a time machine. They feel like they are every age they ever were, because they see each other through thousands of shared memories. As 12-year-olds, they’d sit in a circle, combing each other’s hair. As 17-year-olds, they’d go to parties together deep in the cornfields outside Ames. As 30-year-olds, they’d commiserate over the challenges of marriage and motherhood. Like the Ames girls, millions of us have nurtured decades-long friendships, and we don’t always stop to recognize the power of these bonds. As we age, friendships can be crucial to our health and even our sanity. In fact, a host of scientific studies show that having a close group of friends helps people sleep better, improve their immune systems, stave off dementia and live longer. I'd love to hear about your friendships through your comments below. I'll be checking in to answer your questions, too. I look forward to hearing from you. In addition to Jeff Zaslow, several of "The Girls" will be chiming in on the site today. We are lucky to have this wonderful group of women with us today, and we invite you to ask questions or simply share your own stories about the power of friendship. I don't know where I'd be without the shared experiences that have built so many precious friendships in my life. I'm thankful for so many dear friends, and I still turn to those high school and college friends for support. How about you? I've read about this book in various media and am delighted to see it on Daily Grommet. We all know women are good at relationships but how wonderful to see a relatively large group like this one stick together over so much time and distance. I've been lucky to have a couple of groups somewhat like this but not so close and not over so long a time. I'd be curious to hear about how you as a group of different women discuss and feel about equality of opportunity for women in general and how it has changed over time? Do your conversations move from the personal to the civic and communal? I just finished reading this book. I loved it. It brought back memories of childhood friendships. I actually went out yesterday and bought the book for my four friends who I grew up with. I can't believe the coincidence. They lucked out- I was the oddball "smelly farmgirl"- had very few friends growing up. Hi everyone - I read this book and LOVED it. How are you girls all doing ... Kelly, Angella, Karla?? (I feel like I know y'all). I only have 2 really close friends - but I think you're right. It's now how many of you there are (though you guys are lucky there ARE so many of you), but how you're able to keep in touch and talk honestly about what's happening in your life that matters. And more current friends, as wonderful as they are, will never completely know me or see me the way these 2 do. Thanks for being so honest and open in the book girls - it really makes me want to go back and think about my past and how I've treated people. Mr. Zaslow - you did an amazing job of chronicling this friendship without seeming intrusive. You're such a talented writer (and your wife and girls are lucky to have a "sensitive" Dad!). The common ground of shared experiences during one's "formative" years certainly creates a lasting bond. No matter how different my life now may be from that of some of my high school friends, when we are together I feel a strong sense that these are my roots, and find sustenance and comfort in that. I look forward to reading the book. I picked up this book about two months ago without having heard much about it. I lived in Ames for five years as a child (Dr. McCormack was my pediatrician, too! ), so there was a personal connection that I felt with the book... but more so, the exploration of female friendships over the years is incredible. It's social research and anecdotal evidence rolled into one beautiful story. I laughed, I cried, I reflected... I don't have life-long friends that I have known from birth (outside of my cousins), and it was fascinating to read the story of this special friendship and how it has grown and changed over the years. I'm in awe of the special connection between "the girls", and it has made me re-examine the friendships I have had over the years and why some have lasted and some have not... Facebook has given me the opportunity to reconnect with many of my friends from as early as elementary school, including several friends from my time in Ames!!! I'm definitely taking more time to examine and cherish my friendships even more after reading this book! @Cecilia, you mentioned Facebook in your comment, and that's been wonderful for me, too. I love staying in touch in all the ways we have available now! @Claudia - I like how you see your H.S. friends as "roots" - so true! @ everyone else - thanks for sharing your stories about your friendships. I loved talking to Jane about the "Girls from Ames" and how they felt about being the focus of such an incredible book. I'm honored to have had the opportunity to have met just one of these incredible women and like many of you, it's inspired me to reach back to my closest friends too. Keep the stories coming!! Nice to hear from so many of you! We're all doing well these days. Kelly is in remission and feeling strong and healthy. Angela is going through radiation and has an incredibly upbeat attitude. She is getting a visit from Karen and Diana next week! Karla is putting down roots in Montana and we hope the next reunion will there. I enjoyed watching the video interview with Jane, and thank you for embracing the story of the Ames girls. I was touched to read the comments so far. If any book groups reading "The Girls from Ames" would like to receive a call from one of the women from Ames (or from me) just let us know and we're happy to arrange it. It has been fun interacting with readers and answering their questions. Hi All, Nice to read all the nice comments about the book and your friendship stories. I always knew I was blessed to have these women in my life, they are a wonderful group of friends, so funny and caring. This is Jenny from Ames...It has been so gratifying to hear that this book has touched people at such a deep level. It seems that it either makes women pull their current friends closer to them or inspires them to reach out to friends with whom they've lost touch. How great is that!? Where would we be...who would we be without our friends!? Thank you Barbara and Jeanne, for sharing our book through The Daily Grommet. I'm so glad you enjoyed it. Andi, you had asked how I'm doing, and I wanted to let you know that I'm doing well. We are enjoying our new life in Montana, and as Jane just said, all the gals are coming out here next summer for our yearly reunion, so I'll be looking forward to that. Your comment "I feel I know y'all" is something we have been hearing from many people who have read the book. Jeff is a wonderful writer, and did a good job capturing each of our personalities, so hopefully the readers can keep all eleven of us straight! I have to say I'm amazed you all kept such a great record of your friendship. Did any of you worry that the book would reveal too much or be too personal? Hi Jeff, I can't wait to read this book. I'm curious how you got the idea to write this book and what your background is. Thank you! I had a question for Cathy - did you end up switching careers and are you writing now too? If so, I think this story about your friendship would make for an incredible show. You all seem so down-to-earth though, you probably wouldn't think about that! Thanks for the update Karla and Jane - it's so great to hear that you're all doing well. It's hard when the book ends to let go and nice to be able to catch up! Yes, Isabel there was some concern in the beginning of this process because each of us has a different comfort level with how much we wanted to share. But we trust eachother and Jeff made sure we were comfortable with what he wrote. Even without having read this book, I love it already! I have a group of friends like this from college - we're 12 girls spread from the west to east coasts and Europe too, but when we remain tight, somehow! I can't wait to read the book and to share it with MY girls!! Barbara asked about our perceptions regarding equality of women and how they might have changed over time. We all feel fortunate that we live in a time where we can make choices about our lives. We are a diverse group and we have all made different choices. For example, some of us work outside the home and some of us are stay-at-home moms. But we all respect and honor what our other friends do and this has never been a divider for us. Barbara also asked if our conversations move beyond the personal to the civic and communal. And my answer would be "oh yes...we talk about everything." And I will also add that we don't always agree on everything. But again, we respect views that differ from our own. I've been looking for a book to take with me on a cross country trip this summer (to the wedding of a close girlfriend of 20+ years), and I think I've found it! Thanks, Daily Grommet, for bringing this book to my attention. Friendships are one of the things that make life meaningful. To have even one person who you love unconditionally and who loves and supports you in the same way can be the difference between feeling alone and feeling like you're part of the world. I have been lucky to have developed many close friendships over the years. But I've also moved many times over the years; so staying close has always presented a challenge. Websites such as Facebook (I know several people have already mentioned this) present an EASY way to reconnect with people from the past and to stay closer to good friends. If you haven't tried it yet, check it out. I can't wait to read this book and see how you ladies have worked to make your friendships last! 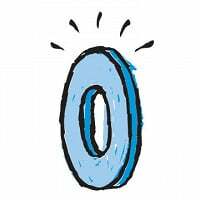 What a special day at Daily Grommet! To the Girls from Ames and Jeff : Thanks so much for being here to answer our questions. Jeff, how would a book group go about arranging a call from you or one of the girls? I think what you said is so important Jane. I'm the only one of my friends who went back to work after having children and I do think it can be hard to stay connected and continue to find things to talk about. I guess, like everything else, this is just another phase in our friendship but the key really is to respect each other's differences and it seems sometimes that just by living farther apart those differences to continue to grow. It gives me such hope to see you girls staying connected and helping each other though. To arrange a book club call in, please visit www.girlsfromames.com and go to the contact page. All the info is there. Thanks for your interest, Joanne! One of my good friends read this book and sent an email to a group us telling us about one of the studies that's quoted in here - that not having close friends can be as damaging to women as it is for them to abuse alcohol, smoke or overeat. Is that really true?? And you mention how women's friendships extend your life too - I want to read this book to find out more about that. Not that I don't believe it - it just makes me look at keeping those connections alive in a whole new light, don't you think? Mr. Zaslow: When you chose this group of friends to write about, did you already know about all the things that had happened to them and how different they each were... in other words, did you know that there was enough there to make it a story? And what's the name of the column you write - I'd like to see what you usually write about. Having just attended my 20 year high school reunioin in the fall, I am reminded how quickly time slips away. Sadly, this spring we buried one of my classmates. It was a bitter reminder that no matter how chaotic life gets, stay in touch with your friends.....because you never know when you are truly going to need one of your "girls". This book sounds FABULOUS and I can't wait to share it with my friends, family and the "Ya-Ya's"! Thanks Daily Grommet for sharing it with us!!!!!! I just had to order this book for my mom!! We lived in a small rural area of Illinois and my mom and 5 of her friends have enjoyed an equally close but not nearly as well documented relationship. The bond created between my mom and her 4 friends has forever bound our families together. Much like "The GIrls" they created a beautiful, well worn patch work life quilt. @ Maureen - I was just about to post that this book makes me think of the "Divine Secrets of the Ya-Ya Sisterhood," or "The Sisterhood of the Traveling Pants!" Has anyone who's read this book read those? Are there any similarities? Did you Girls from Ames guess that the book would ever be this big? Hi! i moved to a small New England town a few years back and I have found it really hard to find friends here who I can trust enough to really open up to. I grew up in the Midwest and my mom had a group of friends similar to this story, they called themselves "the Jolly Dollies"! They loved to yak, drink cocktails at 5 pm, and support each other. I'm looking for that same kind of comradery, but can't find it here! Do you think the whole sisterhood stuff is regional? I guess I find New Englanders more "stiff upper lippers". Would love to hear the Girls' thoughts on the regionality issue. Great to have them all here to talk to, and the author too. Wow! No, Elizabeth, we had no idea that this book would be so big. We frankly weren't even sure anyone would buy the book!! We really wanted this book as a chronicle of our friendship, for ourselves and for our daughters. The fact that the book has taken on a life of its own is immensely gratifying and slightly surprising to us!! @Tricia, I can relate to your comment. I've moved 11 (!) times since college, and each place has it's own style when it comes to how open and easy-to-get-to-know folks are. One of my friends, another smart man like Jeff, is a northerner who moved to the south. His analogy is in synch with Karla's observation: "In the south, there are a lot of front porches, and people like to be outside to say 'hello' and chat. But it's really tough to get past the front door. In the northeast, it's tougher to get that first conversation, but once you're in, you're really in." It's an interesting observation. We're all so transient today, and that's one of the reasons I think I turn to my high school and college friends so very often. My first year in Boston I was on the phone often -- sometimes happy, sometimes in "mourning" for what I'd left behind in Virginia, but always so grateful for the comfort from old friends. Jeff, I'm so happy you wrote this book, and thanks to The Girls for opening your lives. I've lived in three distinct parts of the US and have definitely found a regional difference in how easy it is to make friends! But I have to wonder how much is also due to the timing of when I've lived in those places. In the 60's & 70's, when many of us Grommet fans were forging our life-long friendships, society wasn't as mobile as it is now. People didn't move from region to region as much--they tended to stay closer to a "home base" than we do now. We grew up believing we'd always be together. No matter where we live now, I wonder if our daughters will form the same kind of lasting friendships that are being discussed today? Does our "throw away" society mean that girls don't think of friendships as something that last a lifetime? Do any of the "Girls from Ames" see their daughters forming what appear to be the kind of forever friendships their mothers have modeled? I think what Laura brings up is really interesting... I wonder if our daughters will have forever lasting friendships...especially with all the technology we have today with Facebook, IMing, texting. There is something very special about actually being with a person, in person, seeing their expressions on their faces and their body language that helps you to know someone so well. Technology is a bridge for communication but its also a wall to knowing someone really well. @TR, Jeff's column is called Moving On in the Wall Street Journal. I'm an avid fan, and in my next life I want to be a WSJ reporter just like him. He's a pro. I understand he's also working on his next book, coauthoring "Highest Duty", the autobiography of Capt. Chesley “Sully” Sullenberger, set for release this fall. My 40-something daughter gave me your book, Jeff; and, I love it! It awakens many fun memories for me too. And, of course, your "Last Lecture" was wonderful. I am also a big fan of "Moving On". Thanks again, Daily Grommet - Great interview, Jeanne; also fun reading the Ames girls' comments. I hope this book has some good dirt in it too. Do you 11 friends ever break into different factions and have some knock down/drag out battles? And in the end you all make up with kisses and hugs and tears of joy that you have the best friends evah!! That's more reality with me and my girlfriends! Ha! ha! I will read this book and share with my sistahs! I loved your Last Lecture, Jeff. It made me cry. Thanks! Reading all these comments, I am getting inspired to look up some old friends, maybe through Facebook! @mcc - Thanks! It felt more like a chat than an interview though. Jane has an amazing way of telling the story behind this book that made me feel even more connected to "The Girls". The scrapbook she shared with me was like taking a walk back through my own teenage years ... the Boss, Reagan, their trip to NYC (they saw "Annie") - doesn't get more 80's than that.. Thanks again Jane - and thanks Jeff and all of the Ames girls for all of your insights here today! Thank you Jeanne and Barbara for featuring our book. It has been my pleasure to be a part of this today. Lisa, I will be checking in tomorrow to see your product ! Good luck! I'm sorry I missed this live discussion, but I've loved looking back at what you've all had to say. Jane, your last comment means a lot to me. I have 2 teenage daughters and I have the same concern - they seem to spend so much time texting that I can't imagine they'll have the real-world memories we had with our own friends. Plus, too many times, I've seem them turn on each other, forwarding messages that are supposed to have been private, or writing mean messages (it's too easy to do it anonymously). I also moved around a lot, so only have a few, special friends, but like you girls, we've held on to letters and clippings and still get together after all these years. Hate to say "kids these days" but it does worry me. Hope you're right and they're forging deep friendships in their own, new way ... technology and all! @ReneeG There is one really painful part of the book where the girls do indeed turn on one of their members. How they (the group, and the "target" of their attack) get through that is really interesting. On that note, I had a much more minor "betrayal" with my closest group of friends when we were in the early days of our friendship, and I was really touched, twenty years later, when one of those close friends brought it up during one of our reunions and apologized. You are right..deep friendships are forged through trials as much as anything else. 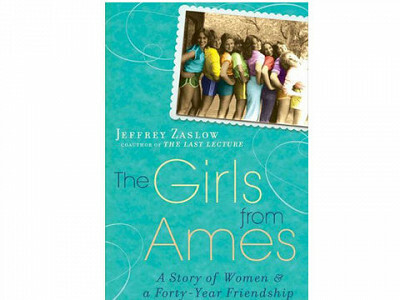 Jeffrey Zaslow may seem like an unlikely candidate for writing a moving history of the friendship of a group of women from Iowa over the last forty years—he is, after all, male—but he does a masterful job of sharing this compelling story. Maybe it’s because he’s male (and can therefore tell it from the vantage point of outside-looking-in), or maybe it’s because of his prior experience in helping to shape a powerful message into book form (he co-authored The New York Times bestseller The Last Lecture with Randy Pausch), but whatever the reason, Zaslow introduces us to the girls from Ames and then inserts each one of them into our hearts. This is not a story about flowers and rainbows and perfection and happy endings. This is a story about real people, with real foibles, real heartbreaks, and how their bonds with one another have buoyed them through the years. It’s about how women need other women to thrive, and how friendships don’t have to be perfect to be just right. Forty years after they met as kids in Ames, these women are still every inch a tribe.